Fund flows will always beat fundamentals. This was rarely more evident than in the performance of MLPs last year. Throughout 2018, earnings reports from pipeline companies were generally in-line, with positive guidance. Operating results contrasted with stock prices, which confounded investors and management teams as they sagged. Negative sentiment worsened late in the year, not helped by broader market weakness caused by trade friction, Fed communication mis-steps and the Federal government shutdown. 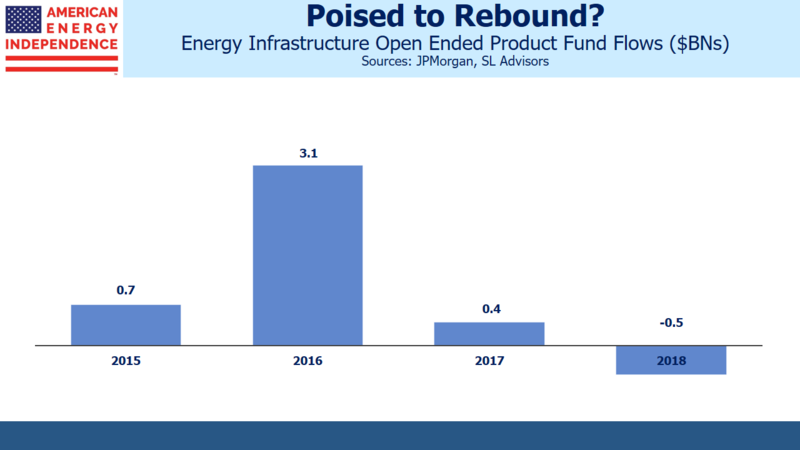 JPMorgan calculates that there is $38BN invested in open-ended MLP and energy infrastructure products, across ETFs, mutual funds and exchange traded notes. In spite of peaking in August 2014, the sector saw inflows during the three subsequent years. This reversed dramatically late last year, as retail investors liquidated holdings. November and December saw $1.9BN in net outflows, enough to depress prices regardless of news. Looking back over several years, the period looks like a selling climax, with no similar episodes visible. Conversations with redeeming investors revealed many unwilling sellers. Taking tax losses motivated some, while others confessed to exhaustion with poor stock returns in spite of apparently improving fundamentals. Like all money managers in the sector, we were faced with little choice but to sell on behalf of such clients. Interestingly, MLP-dedicated funds received a disproportionate share of redemptions. This makes sense, given their flawed tax structure (see MLP Funds Made for Uncle Sam). The drag from paying corporate taxes on profits has been substantial in past years of good performance. Hinds Howard of CBRE Clarion Securities recently noted that, “MLPs are less than half of the market cap of North American Midstream, and the number of MLPs continues to shrink. This is ultimately a good thing for those public players that remain, who will achieve greater scale and competitive bargaining power.” Many big pipeline operators are corporations, so an MLP-only focus makes less sense because it omits many of the biggest operators. Howard went on to add that, “…it has significant ramifications for the asset managers with funds designed specifically to invest in MLPs.” This is because such funds are faced with an unenviable choice between sticking with a shrinking portion of the overall energy infrastructure sector, or dumping most of their MLPs in order to convert to a RIC-compliant status (see The Uncertain Future of MLP-Dedicated Funds). These are additional marketing headwinds on top of last year’s weak returns. 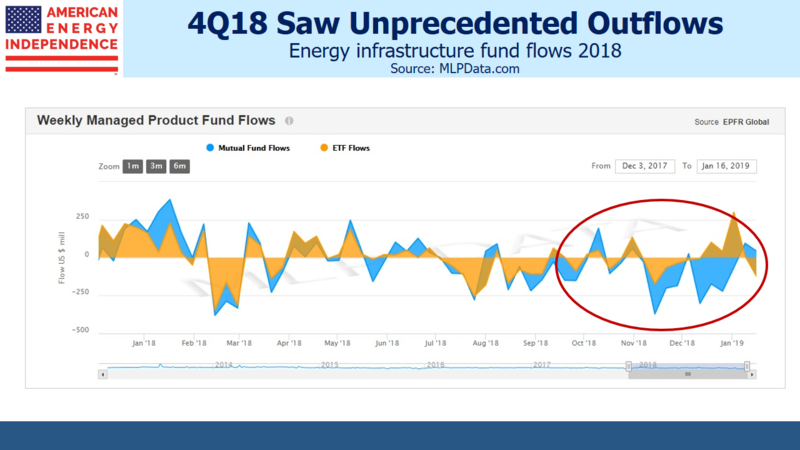 2018 fund flows suggest that investors in MLP-only funds are beginning to realize this problem, and are acting accordingly. The biggest such funds saw $2.6BN in net outflows during 2018’s latter half, 88% of the total, although they only represent 55% of the sector’s funds. Investors redeemed from tax-burdened MLP funds at almost twice the rate of the overall sector. 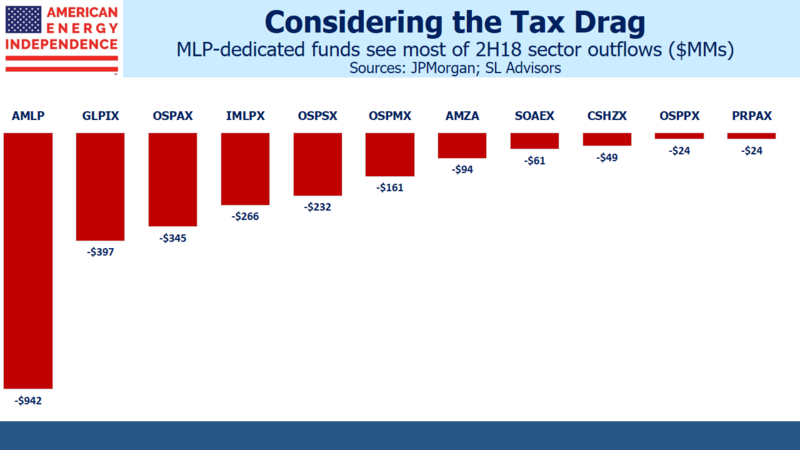 Many feel the sector is due a good year, and if it is, corporate taxes will lead to correspondingly high expense ratios for MLP-focused funds. Early signs in 2019 are encouraging. The outflows abruptly ended at year-end, and investors we talk to are turning more positive. Strong January performance has helped. From where we sit, inflows dominate and new investor interest has increased sharply. Valuations remain very attractive, with distributable cash flow yields of 11%. We expect dividend growth in the American Energy Independence Index of 7-10% this year and next. Momentum seems to be turning. As is often accurately pointed out in this space, MLP funds have a particular structural problem which prevents them from being efficient investment vehicles. 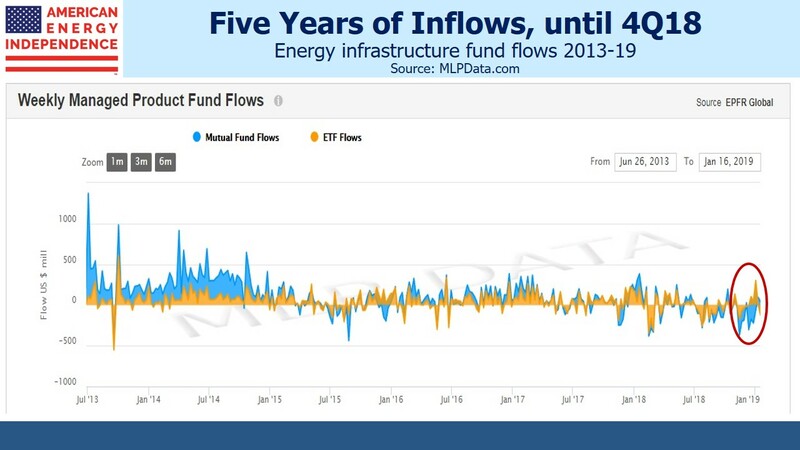 Unfortunately the market often conflates MLP funds (and also crude oil prices) with the fundamentals of individual MLPs and with the significant benefits of the MLP structure itself. Many midstream partnerships have good to excellent and improving fundamentals, increasing EBITDA, increasing distributions and all good things other than a unit price which reflects the fundamentals. And the partnership structure provides a flow though, non-taxable status at the entity level, and largely or entirely tax deferred distributions to the partners. In short, there is absolutely no rational basis for either the inherent flaw in the structure of MLP funds or redemptions from those MLP funds to taint the partnership status in general or fundamentally sound MLPs in particular.